• For quantitative determination of aspartate transaminase (AST) activity and evaluation of drug effects on AST activity. • Sensitive. Linear detection range: 2-100 U/L. • Simple and convenient. This simple, convenient assay can be carried out in a microplate or a cuvette and takes only 10 min. • Aspartate Transaminase (AST), also known as serum glutamic oxaloacetic transaminase (GOT) or aspartate aminotransferase (ASAT/AAT), facilitates the conversion of aspartate and a-ketoglutarate to oxaloacetate and glutamate. There are two isoenzymes in humans: GOT1 is a cytosolic isoenzyme derived from red blood cells and heart; GOT2 is the mitochondrial isoenzyme found mainly in the liver. AST is elevated in liver and muscle diseases. It is part of diagnostic tests for liver function, myocardial infarction, acute pancreatitis, acute hemolytic anemia, severe burns, acute renal disease and trauma. Simple, direct and automation-ready procedures for measuring AST activity find wide applications in research and drug discovery. 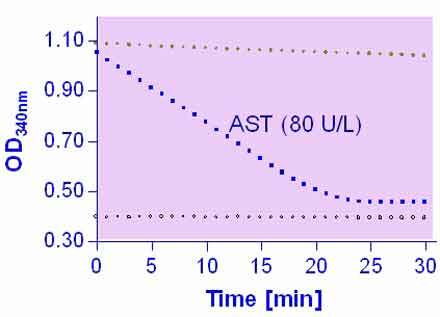 BioAssay Systems AST activity assay is based on the quantification of oxaloacetate produced by AST. In this assay, oxaloacetate and NADH are converted to malate and NAD by the enzyme malate dehydrogenase. The decrease in NADH absorbance at 340 nm is proportionate to AST activity. 1. I am not quite clear about the factor 388 used in the calculation. How is path length correction for 220 µl of sample volume in the 96 well done? Is the concentration of the NADH used 10 mM? The concentration of the NADH solution is 10 mM. The concentration of NADH in the final reaction volume (V = 220 μL) is calculated by accounting for the dilution steps when preparing the working reagent, i.e. 4 μL/206μL in the first step and 200 mL/220 mL in the second step. This is the final initial concentration of NADH in the reaction. To calculate the activity of the sample, i.e. µmoles NADH consumed / (L x min), one has to divide by 5 min incubation time and multiply by the dilution factor of the sample which is 11. Multiplying all these constant values together equals 388. There is no need for a path length correction, because the sample and the standard wells contain the same volume. 1. Jiang, S., et al (2014). Effect of perches on liver health of hens. Poultry science 93(7): 1618-1622. Assay: Aspartate Transaminase in Hen serum (Pubmed). 2. Laura, BP et al. (2015). Lasting effects of butyrate and low FM/FO diets on growth performance, blood haematology/biochemistry and molecular growth-related markers in gilthead sea bream (Sparus aurata). Aquaculture 454: 8-18. 3. Vives, V et al (2014). Pharmacological inhibition of Dock5 prevents osteolysis by affecting osteoclast podosome organization while preserving bone formation. Nature Communications 6: 6128. Assay: Serum in Mice (Pubmed). 4. Seemann, S and A Lupp (2015). Administration of a CXCL12 Analog in Endotoxemia Is Associated with Anti-Inflammatory, Anti-Oxidative and Cytoprotective Effects In Vivo. PLoS One 10(9): e0138389. Assay: Serum in Mice (Pubmed). To find more recent publications, please click here. To find more recent publications, please click here.